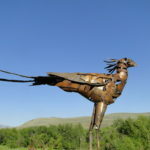 A sculptor from Okanagan, Wa., East of the Cascade Mountains. Dan comes to sculpture from a science and art education background. With a BS in Wildlife Biology from Washington State, he continued on to receive his Art and Teaching Certification. 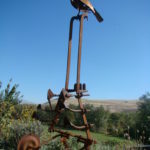 For many years he taught science and art in Soap Lake, Wa. He taught Environmental Education for the Peace Corp in Paraguay and worked as a Biological Technician in Umatilla National Forest, Or. 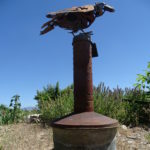 He continues to teach drawing, painting, art history, printmaking and sculpture in Okanagan. And has developed a school sculpture garden and permanent art collection. 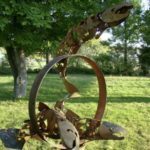 He pursues his own cut steel sculpture combined with found objects to create some very exciting outdoor sculptures of birds and fish.